A resident who lives on Lynch Street SW took video of a GRPD officer confronting two teens on March 11, 2019. One video shows police stopping a 15 and 16-year-old last week, the other shows the arrest and use of force on an adult man Sunday night. 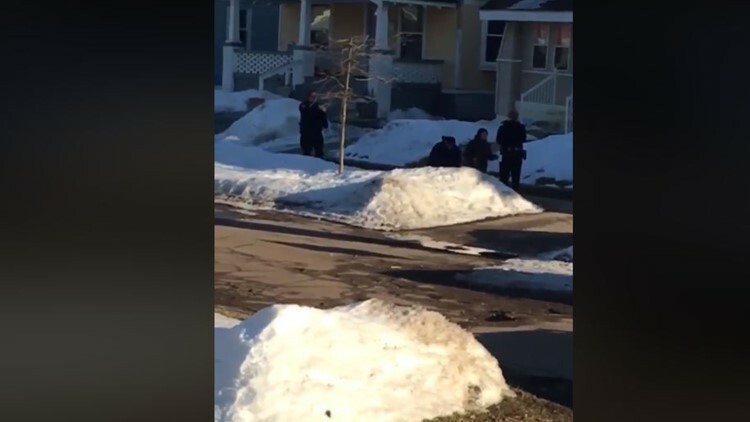 GRAND RAPIDS, Mich. — Police addressed Monday two videos garnering attention on social media involving the arrest of two teens and the use of a force and arrest of a man. A neighbor videoed the arrest of a 15 and 16-year-old on Lynch Street SW on Monday, March 11. Grand Rapids police say the teens were walking down the middle of the street when an officer asked them to move to the sidewalk. The officer then asked the boys for their names and dates of birth. "After repeatedly not providing basic information or following instructions, the officer decided to arrest them, due to their required cooperation to follow instructions and provide basic information," wrote GRPD Sgt. Cathy Williams in an email last week. Sgt. Williams said the boys began to walk away after being informed they were not free to leave. "The officer grabbed an arm of one of the individuals who then resisted arrest. When one of the subjects reach behind his back, the officer did pull out his firearm," Williams said. Williams said the officer had been assigned to spend extra time in the neighborhood where the boys lived due to a "high number of violent crimes" in 2019 and due to "consistent gang graffiti that indicates potential violence." The 16-year-old was taken home, while the 15-year-old was taken to juvenile detention for resisting arrest. According to family, he was picked up later that day. The second video, shared thousands of times on Facebook, shows the arrest of a man on the city's west side Sunday night. Police say the arrest happened at California Street NW and National Avenue NW. The video shows a man physically pulled from his car before an officer deploys their taser. Another officer can be seen using force as the man lays on the pavement.